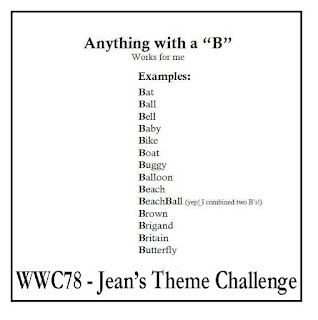 It's "theme" week at Watercooler Wednesday Challenges and Jean Fitch is the host. She has challenged us to make a project that uses "B" in it. For my card I used the sentiment from the Jar of Love stamp set with the work "best." 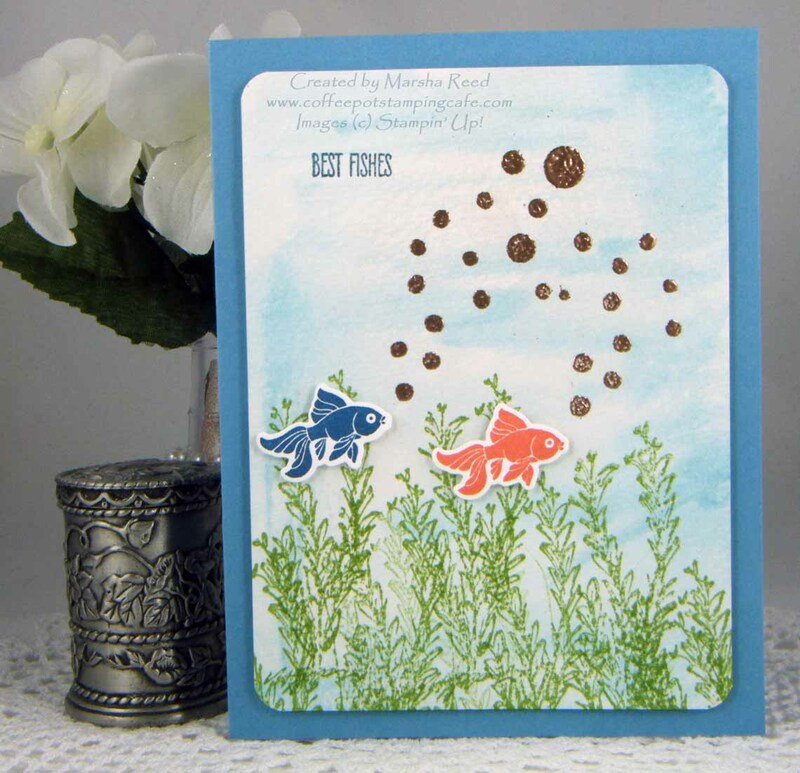 The "bubbles" are embossed using the new Copper Embossing Powder which I just happen to love. And, I used two shades of "blue," Marina Mist and Dapper Denim. So, I think I've got the "Bs" covered. What "B" are you inspired to use? For all the challenge details and to share your project, visit Watercooler Wednesday Challenges by clicking the image below. We'd love to have you join us. It's a very special hop for us this month as it marks our 3rd Anniversary of blogging together. What makes it even more special is having the original hop group join us. As always, our Hop runs in a circle. If you start at the top and go through or whether you start at the bottom and go through, you will wind up where you started. So, sit back and enjoy the fantastic projects of all twelve of our participants. Prepared to be Wowed! My first card is an anniversary made just for our blog hop. It's a little of this and a little of that. I think I just wanted to have fun with shapes. 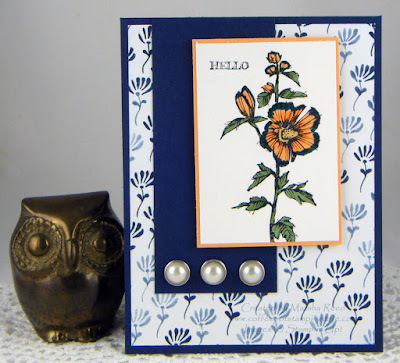 My next card uses Gorgeous Grunge which is an original stamp set used on the blog hop when it started in 2013. It's also one of my favorite stamp sets. I paired it with the butterflies from Papillion Potpourri. My card is a CASE of a design by Anne Laflamme. 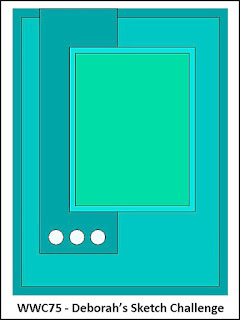 My final card is a CASE (Cope And Share Everything) of a project that Heidi Weaver shared on that very first Blog Hop. She made a box but I made a card and of course changed up the paper and the colors. 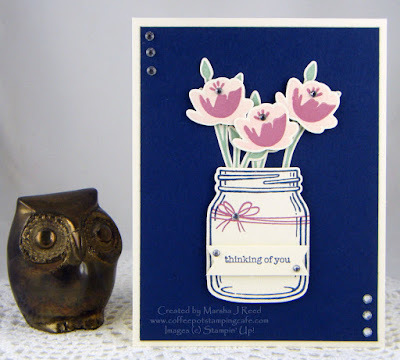 If you'd like to see her project, click the following link: Stampin Along With Heidi. Next up is Gail Allen. To take another look at her projects, click on the image below. To take another look the projects by Penny Hanuszak, click on the image below. To head home to the Wacky Watercooler Stamping Blog, click the image below. This week I'm hosting the challenge over at Watercooler Wednesday Challenges. 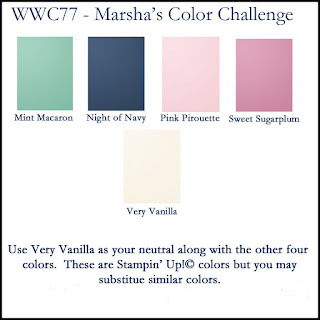 I've picked four colors, Mint Macaron, Night of Navy, Pink Pirouette and Sweet Sugarplum, that all work well together. For the neutral, I chose Very Vanilla. I love how the Night of Navy layer makes the flowers and jar pop. So, come join us and share how these colors inspired you. You have until 1:00 p.m. Central Time on Monday, July 25th to link up your project. Summer is in full swing here in my little corner of the world. Hot days, warm nights and dreams of cooler weather. 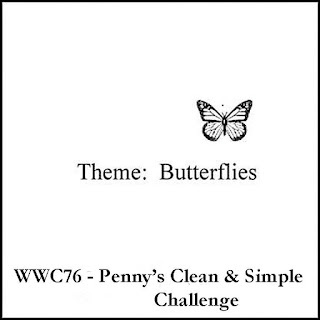 For this week's Clean And Simple (CAS) challenge, Penny has chosen the theme of Butterflies. I love butterflies and I seem to have a tendency to make them all blue. 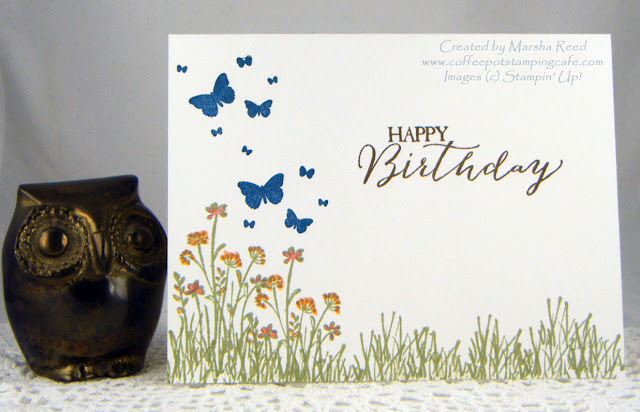 Although I used the In the Meadow stamp set for the grass and flowers, I pulled out my Perpetual Birthday Calendar stamp set and used those butterflies. While our challenge rules state you can add one layer onto your card base, I chose to keep it a single layer card. 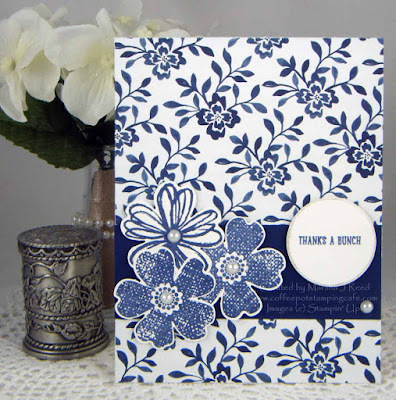 I love trying to come up with a simple card that looks nice but has no embellishments other than the stamp and ink you use. At this time, I'd like to share with you our rules for the Clean And Simple (CAS) challenge we have at Watercooler Wednesday Challenges. You can make a single layer card or you can add a single layer to your card base. No embellishments, no embossing folders and no die-cuts are allowed. 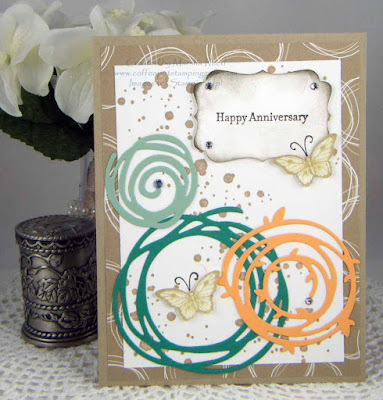 But, you can add color by heat embossing with your favorite embossing powder. Just take a look at all the Design Team projects to get an idea of what we expect. Follow these rules for your Clean And Simple project and you could be our next winner! This week at Watercooler Wednesday Challenges, Deborah has given us a wonderful sketch to inspire our creativity. When I first saw the Floral Boutique Designer Series Paper, I fell in love with it. Night of Navy and Whisper White, what a great combination! To keep the card from being a monochromatic blue, I added a touch of Peekaboo Peach as one of the layers. I didn't have a Night of Navy Stampin' Write Marker so I used my Dapper Denim marker around the edges of the Peekaboo Peach flower. It darkened just enough that it almost looks navy. The stamp set I used is the new Fabulous Flora. For all the challenge details and to share your project inspired by Deborah's sketch, visit Watercooler Wednesday Challenges by clicking the image below. We'd love to have you join us. I've also entered my card in the SUO Challenge #152, Delight in Nature. For all the challenge details, visit SU-Only Challenges. 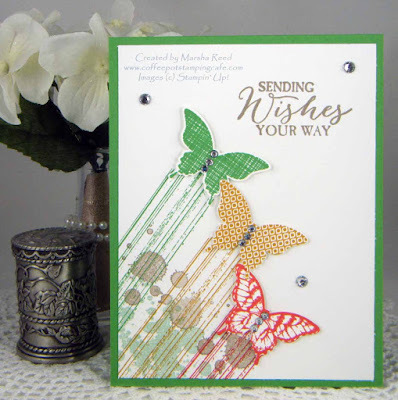 My card has also been entered it in the Addicted to Stamps and More challenge. For all their challenge details, click the image below.